This is the first year I have seen Champions on Ice more than once. The first time was April 14 in Philadelphia, then June 1 in East Rutherford, NJ, and finally, August 3 in Las Vegas. There are so many reviews of every show, that I will just write a summary of all three shows, and some things I noticed that took place off-ice. I just wanted to get my Las Vegas backstage report up first, and then I’ll write about the actual skating when I get a chance. 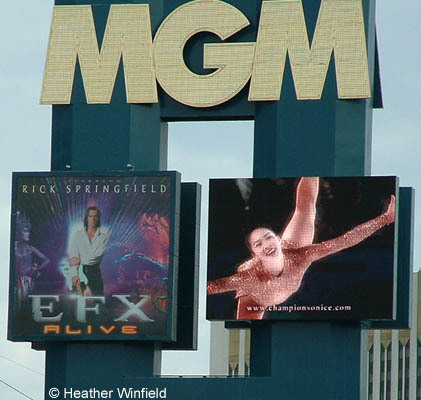 First, let me make it clear I did not go to Las Vegas just to see the show, LOL. We were planning to go out there for about a week, and it just so happened to coincide with the day COI would be out there. Of all the shows, I think this was the best one, other than several skaters missing. There were very few mistakes that I can remember. Even though we sat closer (row number wise) in the NJ show, it seemed like we were closer to the ice here. Maybe part of the reason was in the Vegas show, there weren’t any boards? Wait, let me rewind a second for some COI references before the show! As you are leaving the gate area in the Las Vegas airport, there is this big screen that advertises shows at the MGM Grand. As we walked past, they were showing the commercial for COI! After a long flight, that was nice to see. Also, when you are driving from the airport to the hotels, there’s a billboard for the show that has a picture of Michelle, Irina, and another skater I couldn’t see because of my angle in the cab. In addition, in the hotel room, they give you a free magazine called Showbiz, which has a full page ad for COI, with a pic of Michelle, Irina and Tim. 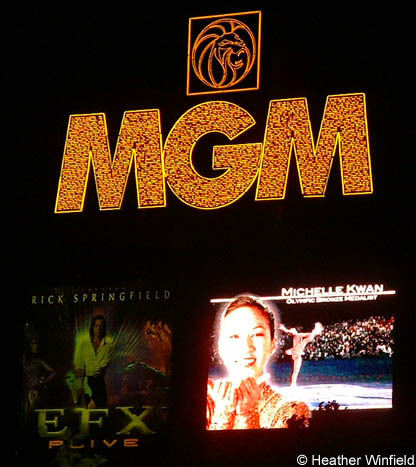 Finally, outside of the MGM, the commercial is showing on their HUGE screen. So exciting. :) I kept trying to take a picture of the sign when they showed Michelle up there...thank goodness I had a digital camera, or I probably would have wasted a roll on that alone! I did finally get one during the day, and one at night. You have no idea how long it took me to get it, LOL. I was supposed to have backstage passes, but they weren’t left for me. To make a long story short, let me just say we had some good luck (I still can’t believe our timing!) in order to finally get the passes that I was supposed to get. So, a huge thanks to everyone that made it happen. :) I was at the show with my mom, and online friend Ginny, and was happy to have been able to get 3 passes so we all could go backstage. So, after the show is over, we make our way to the other side of the arena, where we are supposed to meet before being led backstage. We got there just in time...as soon as we got there, they were taking us backstage. So, we ended up towards the front of the line (last year, since I was towards the middle, I could see who was coming in advance, get ready etc.) It was different than when I went backstage last year in Philadelphia. There was no rope, so it seemed more open, an opportunity to talk with the skaters, rather than just a line, you know? Also, backstage this time was a hallway, and it was really bright. In Philadelphia, you went down into the basement or something, and it was pretty dark. Before I forget, let me say that instead of getting a program, and having the skaters sign that, I brought with me pictures I had taken at various events (Nationals, COI from this year and years past, etc). I thought it would be more personal for me and the skaters. All the pictures were 4x6, except the picture of Michelle. 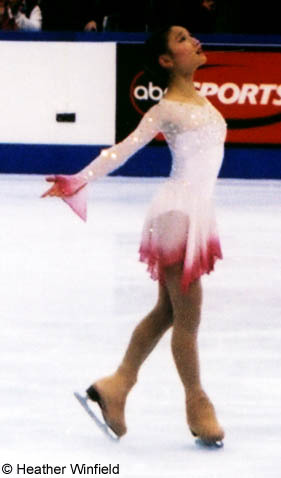 For that, I enlarged a picture I took at Nationals, of her spiral during practice, to an 8x10. Right after we got backstage, I see Danny Kwan walk by. Then, I see Naomi Lang and Angela Nikodinov (no she was not in the show, but I have heard she watches the show a lot) walk by. I look around at everyone standing there doing nothing, and ask the security guy, what just happened? LOL, I asked if they were coming back. He said you have to call their names. So I see Naomi way down the line, and couldn’t believe I missed her. I didn’t know if I should try to go down the line to catch her or what, but I stayed put. I also couldn’t believe I missed Angela. She looked beautiful, BTW. Her hair was curly, it looked adorable. I was upset I missed her, and that I didn’t bring one of the pics I took from Nationals (I have some great pictures of her from that event! ), in case she came back. Oh well, she never came back. Anyway, as we are standing there, not believing we just let two skaters walk past us, a petite girl casually walks by, with a big hat, carrying skates in her hands. I tell my mom to take the pic of Michelle out of the envelope, in case Michelle goes by fast or something. Then, the guy next to me says, “Michelle just passed by.” I kind of stare at him like, do you really think I would let Michelle just pass me by? And I look up see the back of the girl I mentioned before and know it’s Michelle. Ginny, my mom, and I just stare at each other. I think Ginny and I started laughing, not believing after all of this, we missed Michelle! I have no idea why I found this so funny, but I couldn’t stop laughing. My mom’s upset, but I think, oh well, what can we do now? Then, I see Ann Patrice McDonough. When I saw she was in the show, I was really happy I decided to bring a picture of her I took at Nationals. I wasn’t sure she would be there, but I was hoping! As soon as I saw her, I called her name (should I have called “Ann Patrice” or “AP” or “Ann”? I’m not sure, but I yelled “Ann Patrice”), and she came over. She signed my picture, and I stupidly didn’t ask for a picture, LOL. Then she kept walking. Then, Naomi comes by again! Yea! I yell her name, and she comes over. I ask her to sign the picture of I have from 2001 Nationals of her and Peter with their medals, and then I ask for a picture. All these skaters are so beautiful closeup. Hmm, I should have asked her about Angela. After she left, I said something to the people around me that I shouldn’t be the only one yelling the skaters names, LOL. At some point around this time, Nicole apparently walked by. I was saying towards the end of the night the skaters I hadn’t seen yet, and my mom said she saw her pass by around the time we missed Michelle. Then Timothy Goebel came our way. He signed my picture from Nationals and I asked him for a picture. He put his arm around me, and I finally got a nice picture of Tim (none of my Tim picture seem to come out right, for some reason!) I think I blurted something about congratulating him on his great season, but maybe it never came out, LOL. After Tim, I saw Victor Kraatz, and he signed my picture from NJ COI. He looks so different with his new haircut. I never saw Shae Lynn, so I must have missed her. Then, Lou came back to us, and told us to follow him, and the next thing we know, we’re right by Michelle! I actually had something planned to say, but that all went out of my head, and I just put my picture by her, and she signed it. I asked for a picture, and she said sure. I didn’t even move close to her, I have no idea why, LOL. She looks great in the picture, but I’m at a weird angle, so I look horrible. Anyway, then she moved away. I actually had something else I wanted to get signed, and like I said, I didn’t even say anything, not my name, nothing about my site or the forum, nothing. I could have even moved farther down the line to try to catch her again, but I didn’t, I just went back to where we were originally. I can’t believe myself. Anyway, then I saw Peter Tchernyshev, and I called his name. He said he’d be over soon. A little while later, Michael Weiss came by, and he signed my picture from Nationals. My mom asked about his kids, and he said they’ve been in bed for hours. I got a picture with him, and for some reason, that’s the only picture that came out strangely dark. 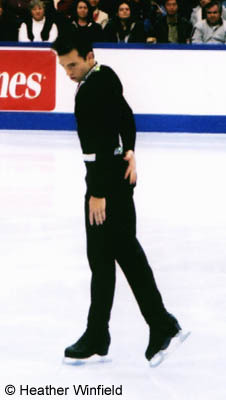 Right after Michael came Elvis Stojko. He was the only one I didn’t have a great picture to get signed (that’s my fault because I have a great digital picture of him from the NJ COI that I didn’t get printed out by mistake.) So, the picture I have is from the finale in Philadelphia, and you can hardly see that it’s him, but he signed it anyway. ;) Then I got my picture taken with him (it was not dark like Michael’s picture was, so it was a weird camera quirk I guess. ), and so did Ginny. Then Surya Bonaly came by. The two guys next to me must have been huge fans of hers (maybe they knew her? ), they gave her flowers and everything. It was really nice. She talked with them for a while. Then she came over to us, and she signed the picture I had from NJ COI. She commented on what a nice picture it was, and asked where it was from. I told her it was from the New Jersey show, and that this was the third show I’ve seen. I think she kind of exclaimed “New Jersey, wow!” She took a long time to sign the picture (I noticed I said that last year, too! ), not only signing her name, but the year, a ying yang sign, and a skate blade. :) And then I got a picture with her. Then, Peter finally came by us. I showed him my picture from last year’s Nationals that Naomi had already signed. He really liked the picture. I actually have what seems like a million copies of this picture, and if I had known he liked it so much, I would have brought a copy for him. Anyway, I said something like “It’s from last year’s Nationals, which you know, obviously.” LOL, I say such stupid things! He asked if I was at Nationals last year, and I said that I’ve been at the last two Nationals. Also, as he was signing the picture, I told him I heard about the coaching change and congratulated him on that. He said “yea, thank you!” After getting the picture, my mom said something about how they deserve a gold medal. On another note, I noticed both Naomi and Peter both wrote “USA” under their names. Irina Slutskaya was next. I’ve noticed it throughout the tour, but I love her hair, the way she’s growing it out. It looks adorable. She seems so different when you see her off the ice. On the ice she looks so powerful, but standing next to her, she’s so small. She signed a pic I took at the NJ show, and I got a picture with her. After Surya, Isabelle Brasseur came by, and she signed a picture I had of her and Llyod Eisler from 1998 COI. I didn’t get a chance to get a picture with her though. After going back to my spot from getting a picture with Viktor, I saw Llyod had passed us already, and was with Isabelle, talking with a few people. I moved towards them, and saw Llyod had this huge bandage over his forearm. I only heard the end of the story, so I’m not sure exactly what happened, but I think he sliced some tendons and ligaments or something? Unbelievable, especially considering how they were able to skate with an injury like that. I was just standing there, not wanting to interrupt, and the woman standing next to Llyod told me to go ahead. So I went over, and he signed my picture. Next was Philippe Candeloro. I had two color pens, black and silver, since some pictures had black backgrounds, and some had light backgrounds. Philippe started signing with his own pen (black), and I said he could use the silver one if it was better (I gave most the silver pen before they signed, but I didn’t get a chance this time). But, he said it was too late, he already started signing with that pen. It was funnier when it happened than me telling it I guess, LOL. Ginny and I both got in a picture with him. Around this time, Michelle’s mom passed by holding Michelle’s dog. I’m not a dog person, but that’s one adorable dog. :) My mom tried to get a picture of the two of them, but she could never get the right angle. Next was Rudy Galindo. I had a picture from the Philadelphia COI show, when he did his costume change right in front of us. He looked at the picture, and said something about what a cute picture it was, or something to that effect. He asked where it was from, and I said which show it was, again how it was the 3rd show I’d seen. He had the same reaction Surya had about that, “wow!” So he was looking at the picture, trying to decide where to sign, and he joked “I guess I’ll sign it over the white haired lady’s head.” And Ginny (who does not have white hair, LOL) was laughing, I think she said something (?) and Rudy said “oh, that’s not you is it?” and we laughed no. So we all had a good laugh about that. That is where he signed the picture, BTW, and he only signed the picture “Rudy.” And then I got my picture taken with him. I saw Oksana Kazakova signing some autographs, so I went over and she signed the picture I had from the NJ show. A little later on, Artur Dmitriev walked by us, and I just caught him. He looked at my picture, and commented like the others, asking where it was from. As he signed, he said it was a really nice picture. We all had so much fun. Even if we hadn’t gotten any pictures or autographs, just seeing the skaters being so nice is so much fun. After we left, you walk outside towards the hotel. I know most of the skaters were staying there for the night, and I guess some others at the show thought so too. There were a lot of fans sitting along where you have to walk to get into the hotel. I saw Elvis walk through, and sign autographs. A couple days after the show, we were in the airport waiting to leave. We saw Isabelle Brasseur, Rocky Marval, and their daughter, who is absolutely adorable. Rocky and their daughter were on our (hour and a half delayed) plane. She was very well behaved on the plane, BTW. :) In the airport, she was running around a bit, and my mom joked to Isabelle that she should put skates on her. Isabelle laughed and said that she should be wearing her skates, so she could catch her! Hope you enjoyed my backstage Las Vegas report. I know I always forget/miss something by the time I write these up. Hopefully if there’s something I miss, I’ll remember it by the time I finish writing my report of the actual skating.